Kent's Travels: What's the difference in speed between USB, FireWire, and Thunderbolt ports? What's the difference in speed between USB, FireWire, and Thunderbolt ports? I was reading about Apple's new thunderbolt port on its new line of computers, and found it quite confusing with all these new port systems. I recently bought a new external hard drive, and it came with the newer USB 3.0. How quick is that? I've decided to I've compiled a chart displaying the most common ports and the years they were introduced (some were created earlier but only introduced later). IEEE 1394, or called FireWire by Apple, is the data transfer system initiated and backed by Apple. 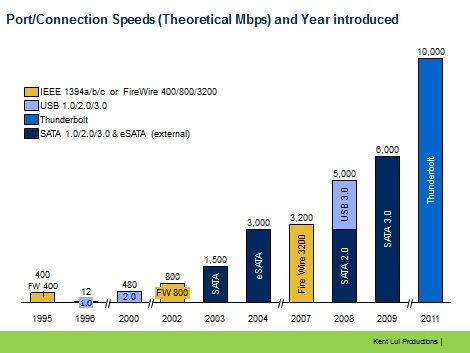 It was a great system for awhile, as the original Firewire 400 had the fastest transfer speed of 400 megabits per second up until USB 2.0 was developed, and that wasn't really commonly used until a few years ago. Apple did stay with the FireWire port, when it increased to 800 Mbps, but in 2011 introduced the Thunderbolt port, which will probably replace the aging IEEE 1394. Universal Serial Bus or USB was developed by Intel and 6 other companies in the PC world to connect external devices to PCs. The USB port quickly became the standard on PCs, and other types of computers (like Macs) too. It co-existed with Apple's FireWire technology, partly because Windows XP in 2001 decided not to move with the USB but stay with the IEEE 1394. Why they did I'm not sure, but USB 2.0 started to become more popular in around 2005 and now has become the standard in the industry on all computers. It is backwards compatible with the USB 1.1, so all devices on that will work on USB 2.0, although at not the same speeds. With 10 times the speed, USB 3.0 will probably be one of the new standard for the next 5 years to come. With so much speed, you could really plug in a lot of peripherals and not have to worry about slow speeds. SATA or Serial Advanced Technology Attachment is the interface for connecting hard drives, optical drives, and other mass storage devices. You usually see the link at the back of an internal hard drive, so if you are transferring files from one hard drive from one to the next, SATA or external SATA (eSATA) is the way to go. However, most people won't need to connect an internal hard drive, so they don't need to worry about this one. So what does this all mean? I'd say for most people all they need is the USB 2.0. FireWire will probably be replaced by the Thunderbolt., and soon computers will move to the USB 3.0, which will obviously work with all USB 1.0 and 2.0 devices. Of course if you're interested in a one step docking station for your Mac, thunderbolt is the way to go, as it can transmit display, keyboard, mouse, and data over in light speed all on one cable. For the PC user, USB 3.0 is probably fast enough to suit all your needs. Automobili Lamborghini vs Tonino Lamborghini- What's the difference?